Be aware this process can take some time, I’ve seen it take up to 40-45 minutes on some older laptops. 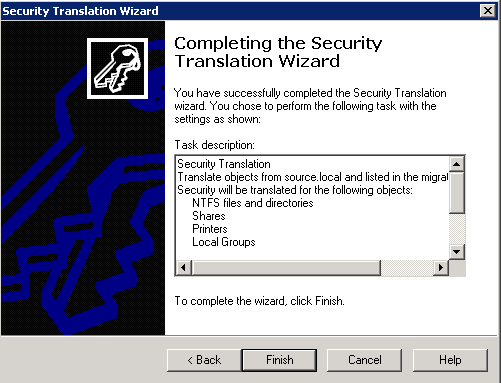 From the ADMT machine, run ADMT and select Security Translation Wizard. If you have migrated the source domain user accounts, you can select Previously Migrated Objects- this will pull the list of the source and target SIDs from the ADMT database for mapping across the new permissions. This is probably the best method if you have migrated the users across, or if you don’t need granular control over the process. You can use a SID mapping file to link two accounts from the source and target domain. In the migration I recently went through, the accounts had already been created in the target domain, and there was no requirement for SID history. I decided that merging the user accounts wasn’t necessary. As I hadn’t migrated the users I was unable to use the previously migrated objects option, as ADMT has no history of the account SIDs in the ADMT database. A SID mapping file was used instead. For demonstration purposes I have migrated a bunch of users accounts so I can choose the previously migrated objects option. We will be translating profiles on a Windows XP SP3 test machine. Files and folders – Select this option to translate security on files and folders on the targeted computer. 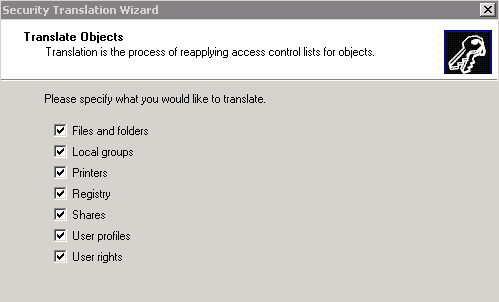 Local groups – Select this option to translate security on the local groups on the targeted computer. Printers – Select this option to translate security on the local printers that are configured on the targeted computer. 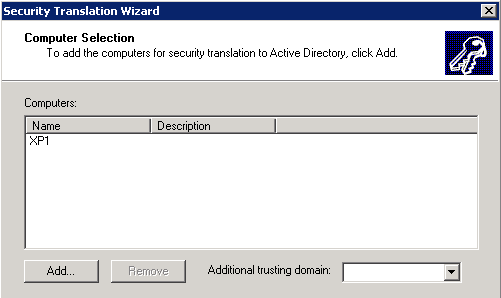 Registry – Select this option to translate security on registry settings on the targeted computer. Shares – Select this option to translate security on the shared resources on the targeted computer. 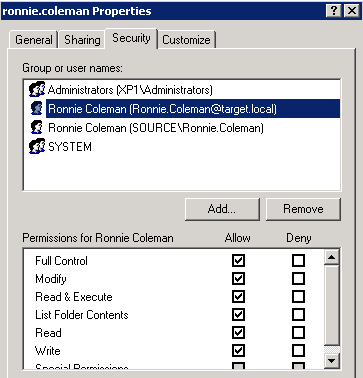 User profiles – Select this option to translate security on the local user profiles on the targeted computer. User rights – Select this option to translate security on the user rights on the targeted computer. 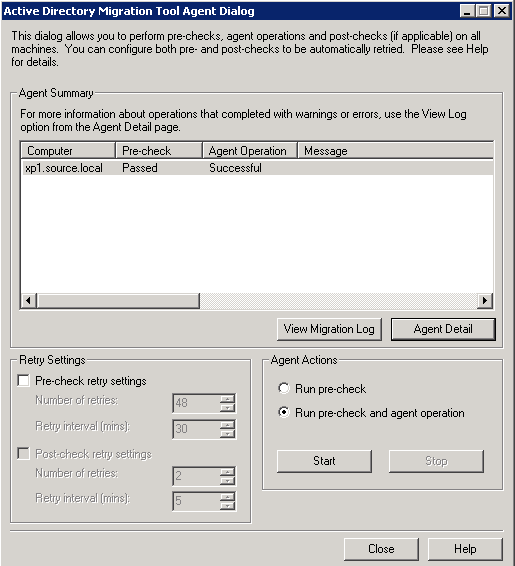 Run the pre-check and make sure it passes, then choose run pre-check and agent operation. After the profiles have been translated you will want to migrate the computers straight away. What happens to the profile? To show you what’s happened I’ve logged into XP1. You can see that the target user has been granted full permission over the local profile. As we chose the Add option, the source domain user also maintains access. The migrated user in the target domain has been added to the profile list in the registry, and the profile is pointing to the source user’s profile. You can view this under HKEY_LOCAL_MACHINE\Software\Microsoft\Windows NT\CurrentVersion\ProfileList. The next part of the series will run through migrating the computer objects and computer domain affiliation to the target domain.